With pastel-colored cottages, bright white roofs, lush, green gardens overflowing with crimson hibiscus, a turquoise sea and pale pink beaches, Bermuda is the ultimate island paradise. As the oldest member of the British Commonwealth (albeit self-governing), Bermuda is a treasure trove of over 300 years of English culture, history and tradition, which it proudly continues today. And, in keeping with all things British, it's also unashamedly exclusive and expensive. Bermuda is just 21 miles long and two miles at the widest and sets upon two extinct volcanoes that rise 15,000 feet from the bottom of the Atlantic. Altogether, Bermuda is made up of some 200 islands; the seven main ones are joined by bridges. "Bermuda is not a Caribbean island," snapped a shopkeeper to a confused tourist. "We are simply Bermuda." To the dismay of the locals, many visitors make the mistake of classifying Bermuda as a Caribbean island. Of course, the locals are correct, Bermuda is 1,000 miles north of the Caribbean; 650 miles off the coast of North Carolina, and has a sub-tropical rather than tropical climate. Yes, there's certain 'snobbery' to be in a class by itself; however, Bermuda is rich enough and beautiful enough to be anything it wants it to be. 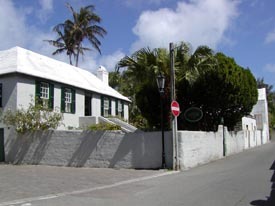 The average house in Bermuda costs around $750,000 and only native Bermudians are allowed to own land. I had an interesting conversation with an amiable Bermudian named Andrew, who stated that when he retires he wants to move to Florida. I was perplexed as to why anyone would want to leave this gorgeous place. He said, "It's too expensive to live here even though some fees are waived for retirees." He says many natives have left the island for Orlando, where there is a large Bermudian community. "After selling our homes and taking much of our retirement we can live very well there," he says. Nevertheless, if you are rich enough you can afford the hefty taxes outsiders pay to own a home. This expense hasn't stopped big-time celebrities like Quincy Jones and Michael Douglas and Catherine Zeta Jones from having homes here. Bermuda is not just another pretty place. Rather, it is a leading international business center. 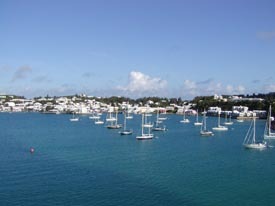 Bermuda's main industry is international business and banking (tourism ranks second). As the world's largest off-shore business center, it offers a corporate tax free haven. A whooping 75 percent of the Fortune 500 companies have a presence in Bermuda simply for the purpose to avoid taxes in their home countries. Besides the abundance of monetary and natural beauty, the island's cultural, social, historical and architectural traditions offer for a laid-back unhurried lifestyle. You won't see fast food outlets or wild nightclubs - it's simply not allowed. No matter where you travel around the island it's always pristine; Bermudians take great pride in keeping their island dazzling. Click here to return to destinations article index.